A first monolingual Italian picture dictionary for primary school students (age 5+), this teaches more than 1000 Italian words and expressions. A cartoon mouse guides young readers through 35 illustrated thematic drawings, introducing vocabulary for home, school and other elements of children's daily lives. Special pages illustrate the meanings of the most common and useful adjectives and verbs. "Vocabolario illustrato Italiano - junior" is suitable for complete beginners. 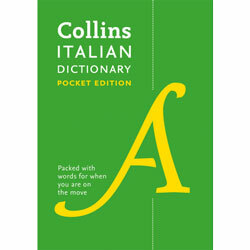 It is a monolingual (Italian-only) dictionary with no English translations or pronunciation guide. Bright colours and is great with useful words and illustrations!Fab buy!